In the previous post, we have covered the topic, how to install and configure the Keystone Identity service which was also a stage involved in the Openstack Deployment. 8. Install Neutron Networking on node1 and node2. Continue with previous post install and configure the Keystone Identity service, we will explain you how to install and configure the Glance component for the Image service on node1. 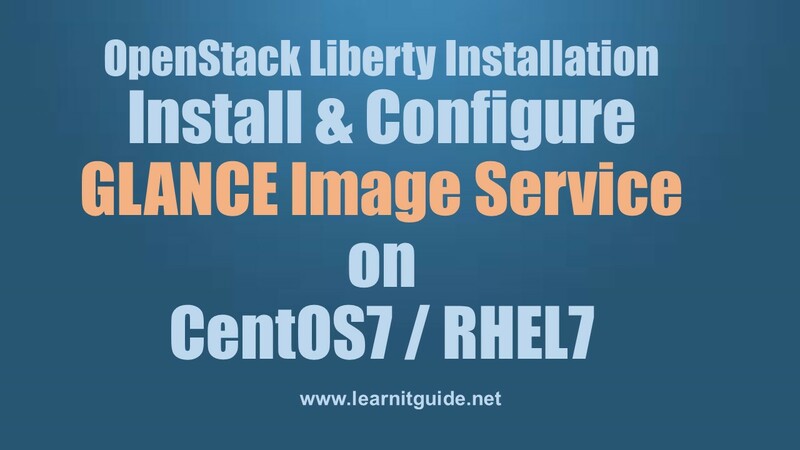 Basically Glance provides Openstack image service which allow us to store and retrieve virtual machine images. be default image service directory is /var/lib/glance/images/. Server should have enough space to hold the images on your disk. 1. Make sure each hosts are reachable. I make an entries in hosts file. 2. Verify the internet connection, because we use puclic repos to install these glance component. 3. Take a backup or snapshot at different stages to restore if needed. Create tables for Glance database. Replace 'node1' with your controller node name and replace 'redhat' with your Glance password you wish to set. Install the Glance Component packages. Change the connection parameter under [database] section. Replace 'redhat' with your glance password which we have set during the Glance database creation and replace 'node1' with your server name. Replace 'redhat' with the password you chose for the glance user in the Identity service and replace 'node1' with your server name. Change the following parameters under [DEFAULT] section. Ignore if you get handler error as "No handlers could be found for logger "oslo_config.cfg""
Start and Enable the glance service. Create the glance user and add roles. Replace 'node1' with your node name. To test the configuration, download ISO image and Upload the image to the Image service using the QCOW2 disk format, bare container format, and public visibility so all projects can access it. here we use only the Cirror ISO image for testing purpose which is smaller in size. List out the uploaded images. Installation and Configuration of Glance Openstack component for Image service on node1 is completed.